Bingo games glossary at gamerisms is divided into 5 parts to include Bingo Games Online Report and UK or British Bingo Lingo. Part 1 of bingo games glossary includes an introduction and letters A - G.
Whether enthusiastic bingo players are at a casino, bingo hall or online, this game is a value bet because, except in progressive games, there is always a winner for each game. First up are bingo cards. Cards are purchased resembling a 5 X 5 grid with 25 corresponding numbers labeled left to right under the five letters spelling B-I-N-G-O. Each number will appear only once on any of the cards. UK bingo cards are selected and printed with 90 numbers. Admission Packet or Buy-In: number of cards purchased for the price of admission. After Game: term for bingo games played after a regular session. Bingo Board: displays bingo numbers on a large board. Bingo numbers lit up when called while others are yet to be called. See Game Board. Bingo Bonus: UK game where winnings are increased based on the number of balls called during the game. Bonus profits are available for a winning bingo called within 46, 47 and/or 49 numbers depending on the club or online game. Bingo Books/Booklets: bound bingo cards in mixed colors in use for each game of a scheduled session. This selection of colors is generally fastened in the order to which they will be played. Bingo Cards: Manufacturer of cards and games produce either a unique series of 6000 or 9000 cards. Therefore, card #3793 will always have the same set of numbers. Bingo Games Glossary Variations: certain variations or patterns are marked or highlighted. Examples of variations range from a) Straight Line or any line across or down or diagonal, Postage stamp: any 4 corners or double or triple stamps and 4 corners, inside or outside picture frame. b) Bingo patterns. Examples are arrows, airplanes, squares, triangles or crosses. c) Letter Patterns: Examples are letters: C, E, F, L, N, O, T, U, X, Y.
Bingo Versions: 4 versions played worldwide online and off. 1) 75-ball version, free center square played on a 5X5 grid. 2) 90-ball versions played on a 9X3 card equal to 9 columns and 3 horizontal. Total of 15 numbers per card while the balance are free spaces. .
3) 80-ball bingo games played on a 4x4 format displaying 16 numbers. 4) Mini Bingo, Speed or Quickie Bingo: played with 30 numbered balls (1-30) only. Blower: device utilizing forced air that tumbles the bingo balls in a cage. The blower then drops or distributes the balls to a bingo caller who announces the number that is then displayed on the Bingo Board. Bonanza Bingo: an additional progressive jackpot coverall game played and announced separately during the bingo session. 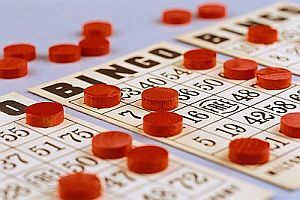 Usually, a bingo session will begin with approximately 45 numbers drawn and marked on game-specific bingo cards. Players pay extra fees for these games and after a pre- determined number of balls called, the card is set aside. The countdown then proceeds at a certain number (47 or less, for example) and if not won will increase one number per week (48 next week, etc) until won. The jackpot payout is calculated based on bingo card sales for that particular game. Breakopen: term for cards manufactured with perforated tabs that when opened reveal numbers and letters that have been determined as prizes. Bullseye: UK Windfall Game where a bingo win is for 50 numbers called. Buzzword Bingo: version that subs words or buzzwords for numbers. These words and phrases are indicated by the player as called. The bingo winner is determined with five buzzwords in a row are completed. Call House: it’s a Bingo Win! in the UK clubs. The equivalent of calling, yelling or bellowing Bingo in North American bingo halls. Caller: a person who calls out bingo numbers as they tumble from the holder. Cash-in-prize: prize money awarded to winners of bingo games. Chat Room: display screen where you can read and reply to messages with other online bingo players. Coverall or Blackout: is a winning bingo that covers all numbers on that particular card. Coveralls for as few as 43 numbers have been recorded. Double Bubble: UK Windfall bingo game where a bingo is called on any of the numbers 11, 22, 33, 44, 55, 66, 77 or 88. The winner receives double the full house prize money. . Early Bird Game: opposite of after game, term for bingo games played before a regular session. Also known as warm-up. Electronic Bingo Cards: also known as TED or GTI, these handheld bingo devices allow ease of play of multiple cards at the same time. While several of these helpful devices can load up to 200 bingo cards, the bingo house may limit the number of cards for one session or game. Some bingo halls require that players use both paper and device at specific times or bingo sessions as it is seen to be an unfair advantage by veteran players. Face: front of card with 25 printed numbers to include free space. Flimsy, Flimsies: printed on sheets of thin paper, these cards may be printed revealing 1, 2, 4, 6, 9 cards, although usually most flimsies have 3 cards printed. For regular games during a session, the cost is low at $1-2 while special games increase the cost. Online bingo games offer frequent promotions for regular bingo games to play for free or reduced cost. Flimsy cards are also known as Throwaways. Flyers: single sheets of bingo cards in UK with 6 sections.Flyers are higher priced than books, however, so too are the prizes. Four Corners: term for pattern bingo games where in order to win, you must have the numbers called on the four corners of your card. Free Space: the center square of the bingo card. This freebie is counted if required for a pattern or coverall win. GTI or TED: term for electronic device to play multiple bingo games for an additional fee. Gamers are allowed only one device/player. Also see Electronic Bingo Cards. Game Board/Bingo Board: a display board that reflects the bingo balls in play. Can also show the type of game being played currently and jackpots available. Game Room: Some online games divide the players into game rooms. These game rooms can have themes or color names like Gold, Diamond, Topaz or Pick & Mix Rooms. Games Variations: bingo games glossary reports these variations: double bingo, triple bingo, coverall, progressives and hall ball, which is the first number drawn at the beginning of the bingo session. If this number is the winning number in any game, a progressive jackpot is won along with the usual award for that particular game. Also see Bingo Cards-Variations. Part 2 of Bingo Games of Bingo Games Glossary includes the letters H-Z. includes versions and variations, Top 10 features for online bingo games play, UK Bingo, trivia and winners.